"If we did realize the difference between the vital few and the trivial many in all aspects of our lives, and if we did something about it, we could multiply anything that we valued." 80% of your resources are producing only 20% of value – this ratio always creates arbitrage opportunities for genuine entrepreneurs and innovators. It helps also evaluate ideas quickly. Focus on exceptional productivity, rather than raise average efforts. Make the most of your creativity peaks and your time. Unless you have used the 80/20 Principle to look carefully at the different chunks of your business and to redirect your strategy, it is almost inevitable that you are doing too many things for too many people. The principle is of enormous value in identifying the next leaps forward for your business. 80/20 Thinking, applied to your daily life, can help you change behavior and to concentrate on the most important 20%. 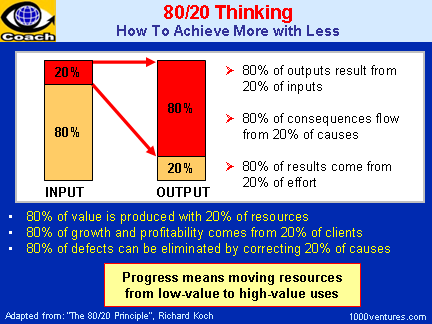 Action resulting from 80/20 Thinking should lead you to achieve much more with much less. To engage in 80/20 Thinking, you must constantly ask yourself: what is the 20% that is leading to 80%? Never assume that you automatically know what the answer is, but take some time to → think creatively about it. "For every ounce of insight generated quantitatively, there must be many pounds of insight arrived at intuitively and impressionistically." 80/20 Principle is inherently optimistic because it reveals a state of affairs that is seriously below what it should be and shows the direction towards a better state. To achieve progress and multiply your output, you must give power to the 20% of resources that really matter in terms of achievement, and get the remaining 80% up to a reasonable level. "Progress takes you to a new and much higher level. But, even at this level, there will still typically be an 80/20 distribution of outputs/inputs. So you can progress again to a much higher level." Don't apply 80/20 analysis and strategies in a linear way. "Like any simple and effective tool, 80/20 Analysis can be misunderstood, misapplied and, instead of being the means to an unusual insight, serve as the justification for conventional thuggery. 80/20 Analysis, applied inappropriately and in linear way, can also lead to the innocent astray – you need constantly to be vigilant against false logic".